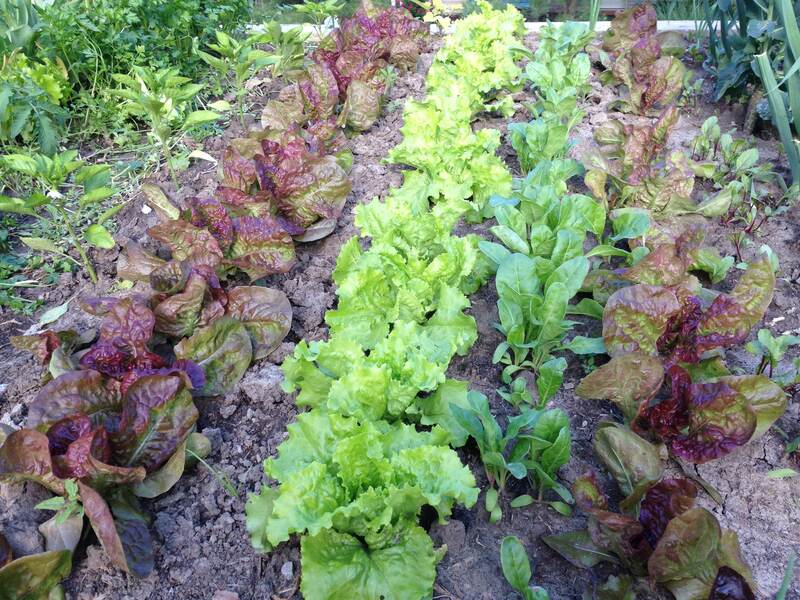 Rows of lettuce in Stevan’s backyard garden. “People don’t know where their food comes from.” You’ve heard this, right? As generations become farther removed from the farm, their experience with with food is, shall we say, less direct. Fortunately there’s a resurgence in backyard gardening to close the widening gap from the farm gate to plate. As more gardeners get their hands dirty they not only produce delicious tasting produce, they learn about the risks/rewards associated with growing food…weather, insects, squirrels and rabbits (in my case), fungus, and much more. Salad fixins’ 15 stories up! 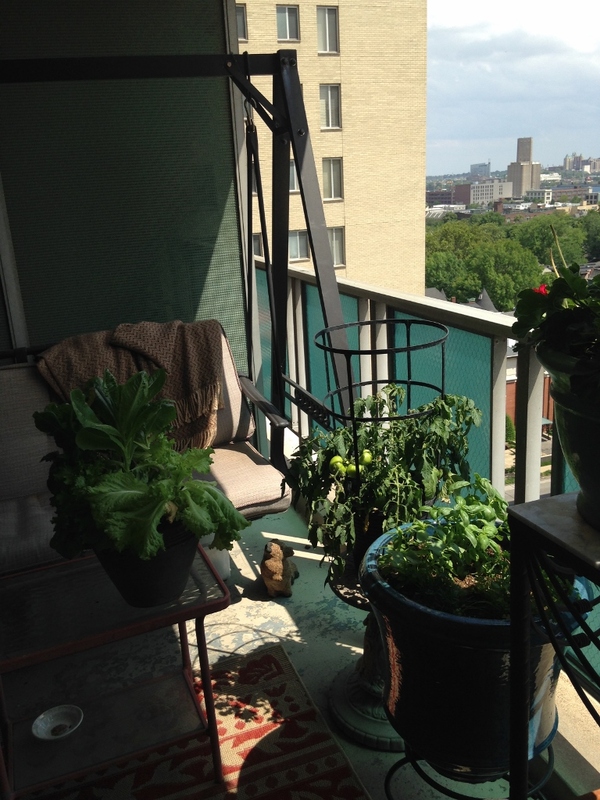 The balcony of this city apartment provides enough space to grow lettuce, tomatoes and an assortment of herbs. Society may have moved further from the farm, but today’s gardeners are successfully growing lettuce, tomatoes and other produce in small spaces. My dear friend Chris takes advantage of small-space living and is growing lettuce and tomatoes growing on her apartment balcony 15 stories up. Stevan, a friend of mine at work, has a backyard garden. And every year he sends me pictures of his lettuce like the one at the start of this post. This year, I joked that he could feed his entire community with the bounty in his backyard. To my surprise the next day Stevan hand-delivered to my desk a delicious Ceasar salad featuring Romaine lettuce picked from his garden that morning. Apparently he and other colleagues have a Ceasar salad lunch day every spring with the bounty from his garden. I am not the only one he’s sharing his lettuce with however. A nearby child center is also benefitting from Stevan’s love of gardening. What I learned when returning his empty salad bowl is that he and others at work share their love of growing food by helping children at a nearby child center plant their own garden. Stevan may have provided the seed and the know-how, but he’ll be first to tell you this more than just lettuce-sharing. He’ll say he’s the one who benefitted by enjoying the kids’ happy faces and the connections they are making to growing food from seed. Lettuce season may be nearing an end here in St. Louis but I’m sure this is just the beginning of their garden delights. 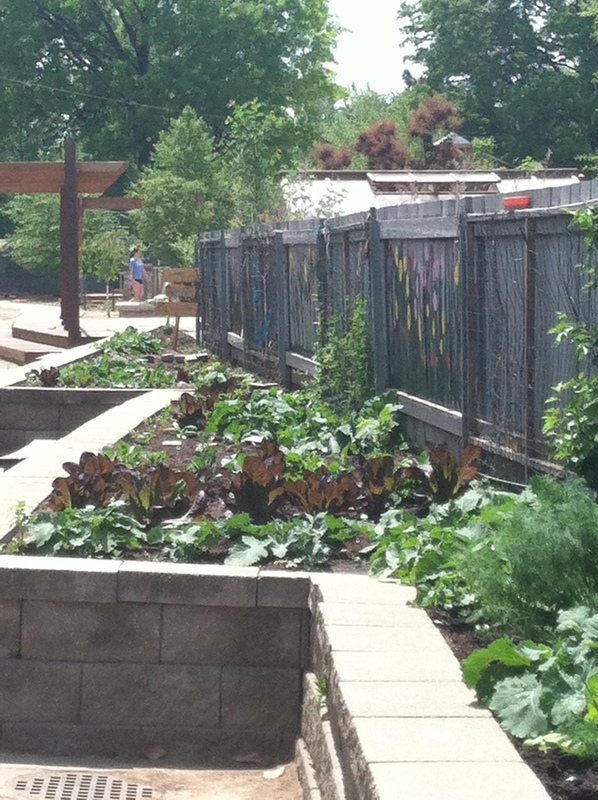 Planted from seed, the vegetable garden at the University City Children’s Center. I’m inspired by my friends’ vegetable gardens. Truthfully, growing vegetables intimidates me a bit. Stevan (who grew up on a farm) tells me that you start simply with an easy-to-grow plant. This year I have patio tomatoes that the squirrels seem to be enjoying, as they have been plucked from the vine at just the opportune time. I have grown peppers and I always have some herbs planted. But next year I may have to visit Stevan’s backyard and get some first-hand pointers. Categories: Inspirations, Musings | Tags: Backyard vegetable gardening, container gardening, small space gardening, sustainability | Permalink.